A doctor’s horse is tripped with wire, injuring it and its rider; a female farmer has a fatal accident in a barn; and a local baron’s son is physically assaulted, all within a small village. 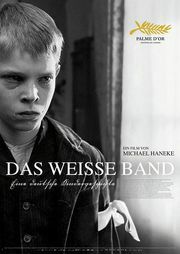 When a disabled boy is nearly blinded, a local schoolteacher begins to suspect a few of his pupils, but the preacher, whose own children he bullies, with amongst other things, the humiliating use of a white ribbon, accuses the teacher of spreading malicious gossip. As the incidents escalate, nothing is done to prevent them, even when a mother and child go missing. It’s dark, gothic and creepy, whist drawing parallels with the end of the First World War and the birth of national socialism. The White Ribbon is bitter, nasty, but ultimately thought-provoking. This entry was posted in YearInFilm and tagged 2000s, 7/10, arthouse, download, drama, germany, mystery. Bookmark the permalink.